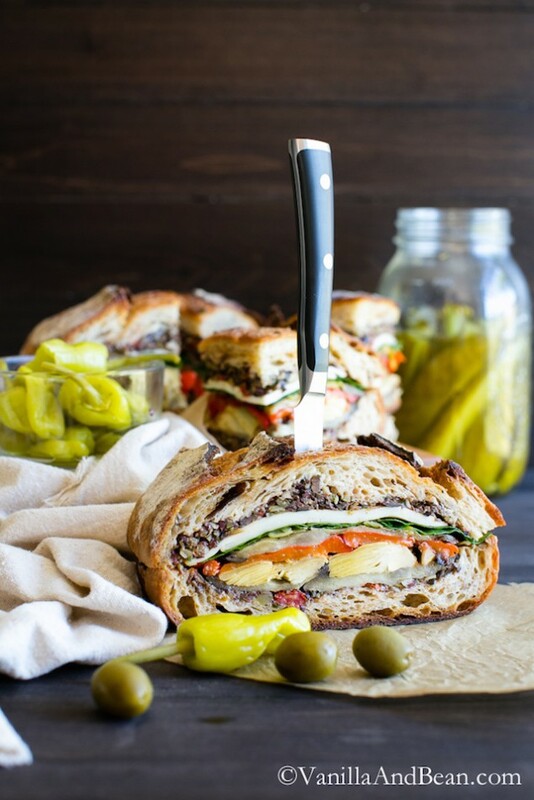 A stacked vegetarian Italian sandwich made with an olive tapenade and eggplant is cold pressed for beautiful layers and flavor. Perfect for fall picnics and tailgates! This sandwich would be one that I would enjoy while reading a book, taking a walk in the woods or picnicking. I discovered pressed sandwiches years ago and have played with ingredients, bread types and ingredient variations ever since. They are versatile in that they pack easy and feed a small crowd. 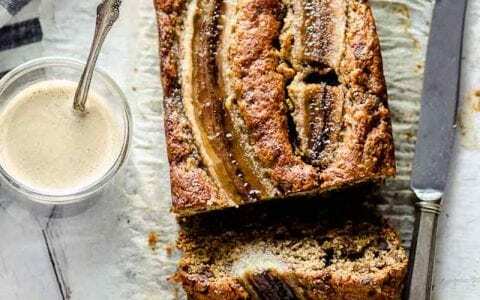 You don’t need a panini press to make this. 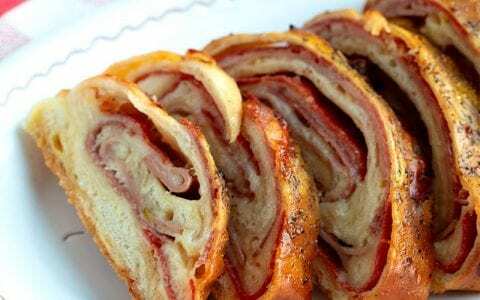 It’s a cold sandwich, snugly wrapped in plastic wrap then placed in the fridge and weighed down with something heavy like box wine, or a cast iron skillet. It needs to rest for a few hours or overnight in the fridge. 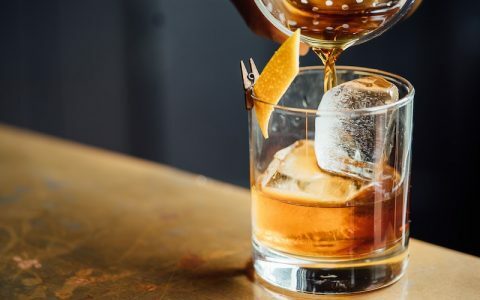 Flavor improves with resting. 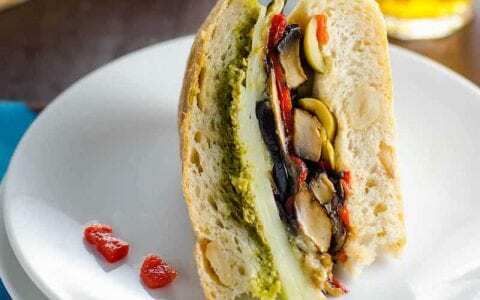 This Italian Vegetarian Muffuletta Sandwich is packed with roasted eggplant, red bell pepper, garlic, a sturdy green of your choosing, artichoke hearts and a mouth-watering Olive Tapenade. Add smoked provolone, or not. The bread? I use a rustic sourdough potato loaf, but ciabatta is a sturdy bread that’ll hold up to the weight of these ingredients too. 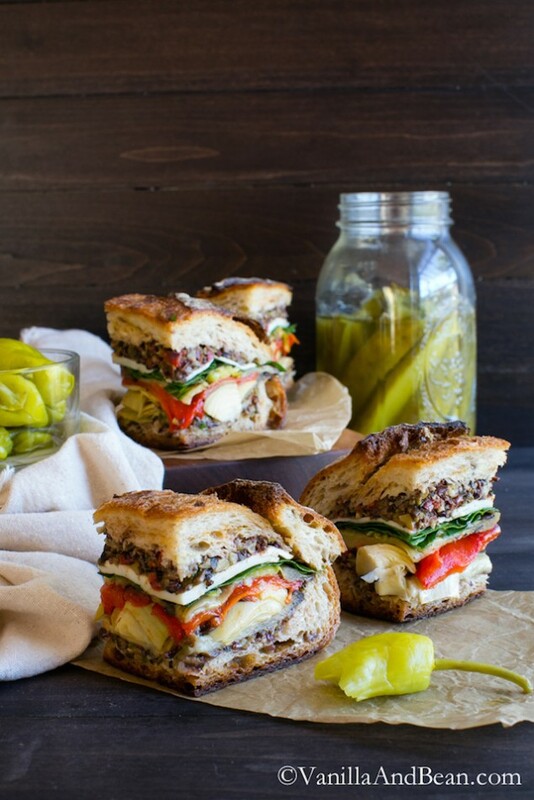 Oh and if you’re on Pinterest, I have a board dedicated to vegetarian and vegan sandwiches with drool-worthy pins from fabulous bloggers that link directly to the recipe. I hope you’ll join me there! Find the Olive Tapenade recipe here. 2 Leaves of Swiss Chard or a few hand-fulls of another sturdy leafy green such as spinach. Preheat oven to 450F (232C). Set oven rack in center of the oven. Line a sheet pan with parchment paper. Cut the top end (not the root) off of the garlic head, exposing the tops of each garlic clove. Drizzle 1 tsp of olive oil over the cloves and wrap loosely in foil. Set it on the parchment lined pan. Slice the bell peppers in half, deseed and lay flat, flesh side down, on the parchment lined sheet pan. It's okay to press on them a bit. Set the timer for 20 minutes and roast the peppers and garlic. Place peppers in a lidded container for 20 minutes. This will make the skin release with ease. Peel pepper skin and set peppers aside. Peel the garlic then mash the cloves until a paste forms. Set aside. Mix the tapenade with red wine vinegar, set aside. Slice the bread lengthwise with a serrated knife. Dig out the inside of the bread on both sides. Try to leave enough crust as to keep the sandwich sturdy. Save the bread dug out and make croutons or bread crumbs with it. Optional - brush on a bit of olive oil, no more than 1 Tbs., on the insides of the bread. Be careful here, the bread can get soggy.. so only this if you love a bit more olive oil (I brush it on mine). Spread the garlic on both sides of the bread. It will be thin. Spread the tapenade on both sides of the bread. Yes, all of it. Press as you spread. 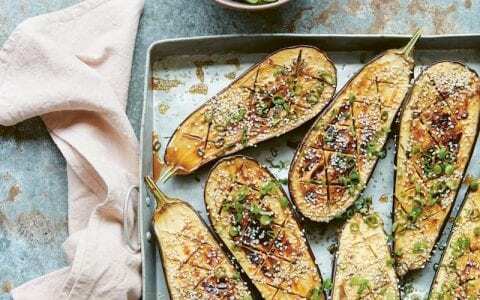 On the bottom side of bread, layer in the following order: 3 slices of eggplant, artichoke, bell pepper, 3 slices of eggplant, a pinch of salt and a few grinds of pepper, pepperoncini, chard or spinach and optional cheese. Place top on sandwich and gently press down. Tightly wrap the sandwich three times to ensure nothing leaks out and place it in the fridge. 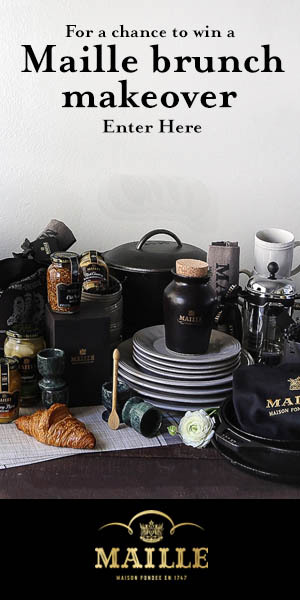 Place a heavy object on top of the sandwich, such as cast iron skillet, or box of wine. Let marinate and press for at least 3 hours. Overnight is better. Cut into 2" wide pieces and then cut in ½ for a smaller sandwich. I yield 5, 2" wide (5cm) pieces, but cut the center cuts in half to make smaller sandwiches. Cut to your needs. Rewrap any remaining pieces tightly in plastic wrap and store for up to two days. 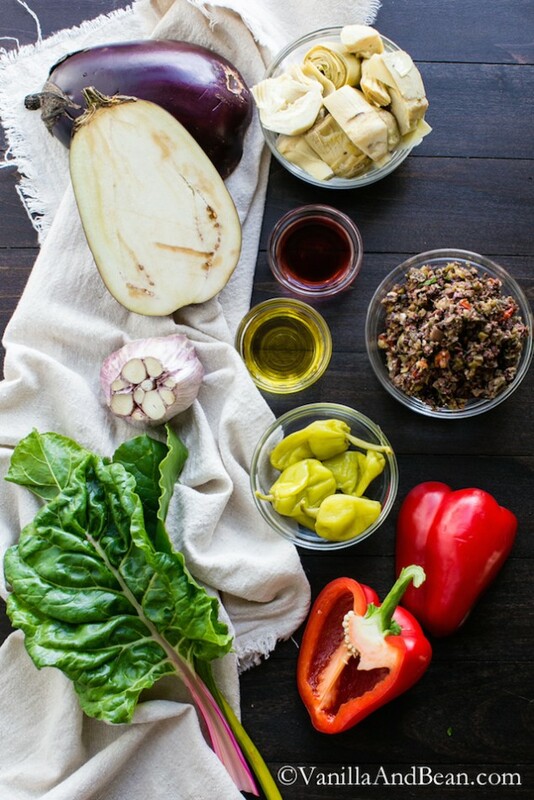 *To save a bit of time, purchase pre-roasted bell peppers and prepared olive tapenade. Drain the peppers well prior to putting them on the sandwich.